On review I see I made a number of typos below, typically writing 744 for 774, but hopefully I've fixed that. Also, I've changed my mind on the 744 yes 744 saucer as I now believe there was no three-digit jumbo: Portage has one I take to be the real 744. 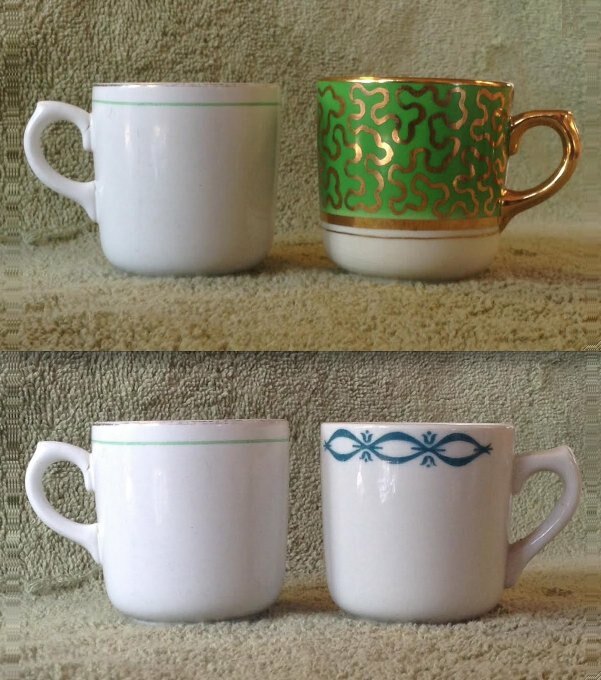 My thoughts on dating crown-and-star-stamped vitrified ware have flown out the window. The advert below copied from Auckland Museum shows (inter alia) three saucers, side by side, numbered 774, 805, and 744. It has been established that the 805 saucer is the saucer correctly matched to the 781 "tulip cup". The saucers to the left and right in the following montage are respectively smaller and larger, both in overall diameter and in cup well diameter. 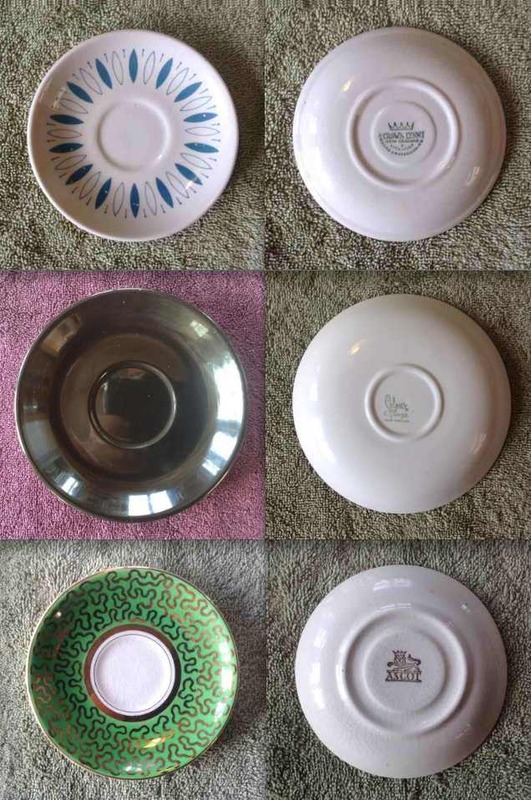 This shows part of the above ad matched with saucers from my own collection. From left ODs are 120mm, 144, and 149. Well sizes (ID) are approximately 40mm, 46, and 54. 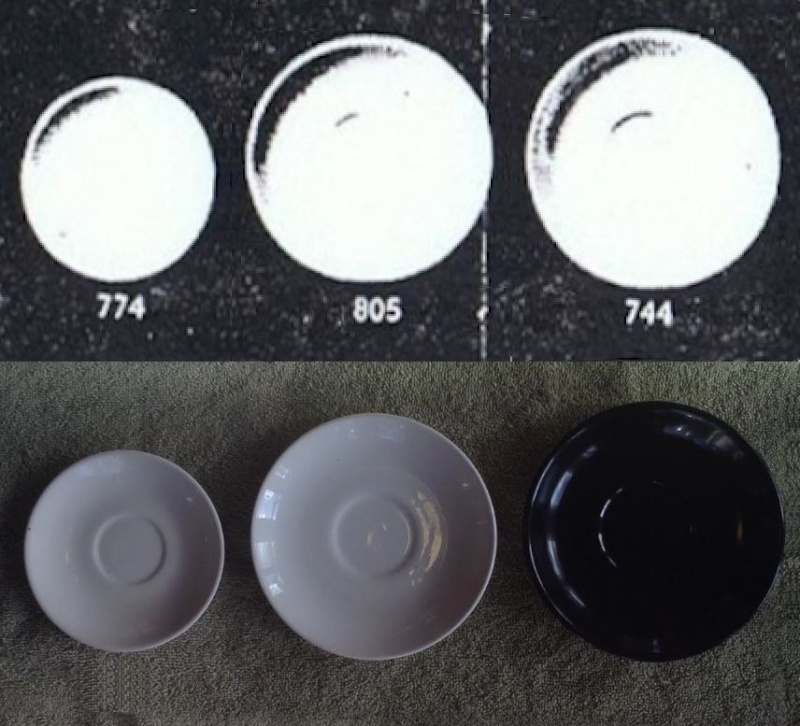 My "774" saucers are matched with earthenware demitasses. I have clear glaze (shown) with early backstamps and Doris Bird ones with 50s-60s stamps. The gallery definition for the 774 is "774 Coffee saucer E/W". There is no gallery definition for an earthenware demitasse: 773 is "Small Coffee Cup vit". I believe the earthenware demitasse is the same shape (... although there is also an 859 E/W "small coffee cup" which may be the "IGA" cup). 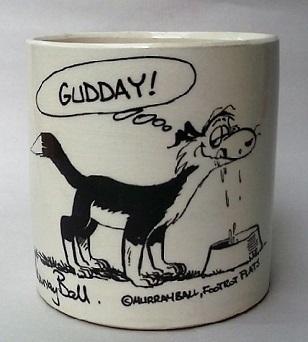 I know my cups are earthenware as some have crazing. I also have vitrified demitasses in the same shape and in the later beefed-up shape. (3633 is a vitrified cup defined as "Small Coffee Cup was 773".) The number in the ad is 774. My saucers therefore are 774. 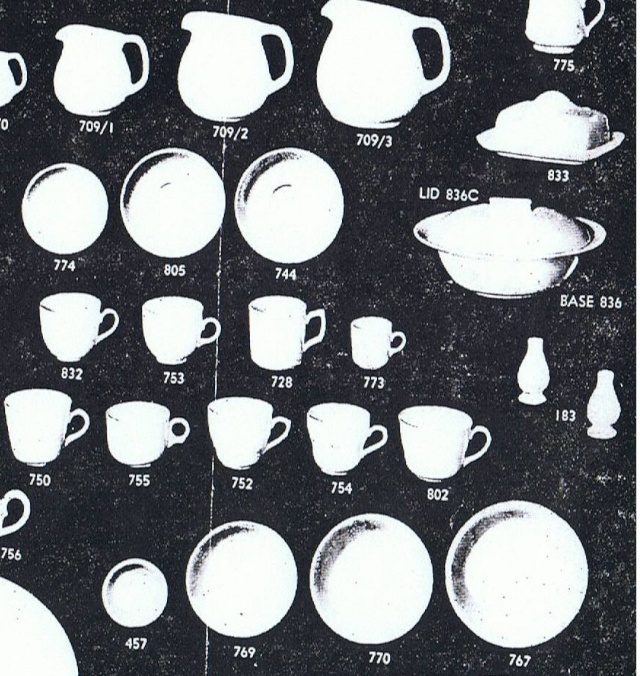 The righthand images are 744 saucers, defined simple as "Saucer E/W". There appears to be no corresponding four digit number. I have six such saucers, all black, marked "Colour Glaze" which came in an original box matched with shape number 3023 Purple Myrle cups. The same saucer is often called a "jumbo saucer" as it is also a fit for, and has been seen pattern-matched with, the cup referred to as "jumbo tulip", for which a number has not yet been allotted in either the 3 or 4 digit galleries. These shapes, 774, 805, and 744, are the only earthenware coupe saucers in the three digit gallery. Very convincing Jeremy and I will go along with your findings. Thanks for the better pic of the 744 Jeremy and I've added the 773 and 3633 demi cups too, even though they are slightly different to the pic which doesn't have that 'flick' on the top of the handle. Excellent work all round Jeremy and I do appreciate all of your time and effort. I just got worried that the Tango 774 might actually be a 4634 but checked the dates and I'm pretty OK with it. The 4634 must have been 1973 or later as earlier 4600 numbers are dated 1973: the Tango s 1966. Even the RNZAF is only 1971. The Reflections one just got is a star stamp so also a 774. I had a look at Anne's three and they are all also 1960s (Ascot, Galaxy) or even '50s (Riviera). The exiting find there is that the Galaxy has a number 2 on it which is the earliest of these vitrified numbers I have seen so far. Reflections is a 1959 pattern, but I do not know when it was first made. My demi saucer is a star not a number so if there is no overlap then as the numbering of vitrified ware started at least in 1962, possibly 1961. This puts the "59" over-stamping of the CHL in some context. So, I'm wondering (assuming no overlap) if we can now date all star-marked vitrified as 1960 or earlier!!! Just re-reading Tarvster on her mother's "tea sets". You seemed convinced at the time that the earthenware demi was a 773. It certainly looks as though the same number applied to both E/W and vit.